True confession: I don't love art museums. I mean, I love them, but I don't LOVE them. Don't get me wrong, I get it. Art appreciation, that is. I understand why something is beautiful or important or ground-breaking, even the modern stuff, which I'm not as appreciative of as I probably should be (read, Rothko "Orange, Brown," seriously?). But, truthfully, I'm more of a quantity versus quality lover of art. I prefer a blitz approach. I don't need to read the placards to feel like I've seen the works. And, I don't need to gaze intently, slowly moving closer and further away from the canvas every time. I mean, sometimes I am struck by something and I stop and ponder, but usually I just walk purposefully through each exhibit hall from one end to the other, pausing only occasionally. 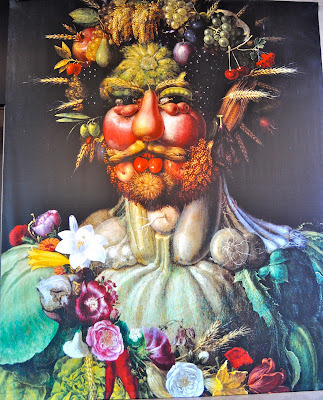 Example: I "did" the Prado is about 2 hours -- that's just how I roll. Kenny on the other hand is more deliberate in his approach. He likes to read EVERYTHING and go slowly, very, very slowly. Luckily for me, the arrival of children means when we go to art museums we blitz them, period. Poor Kenny. I suspect this means that we will be returning to most of these museums once the children have left the nest. But, in the mean time, a visit to art museums these days requires a very specific approach with clearly defined rules. 1) Lots of build-up about how fabulous it is going to be before we even depart. 2) More excited talking in the car intermingled with pointing out "cool" stuff on the drive over. Eg. "This artist uses _________ in his paintings. Maybe you'll be able to see some? Hey, look at that fire truck!" Or. "Would you like to be able to paint ________ too? Wow, do you see that yellow sports car?" No correlation required, just needs to keep their excitement level up. 3) Promises of a fun reward to those who enjoy themselves and behave whilst viewing the art. 4) Limiting ourselves to one exhibit or just a few rooms of the standard collection. 5) Very stern conversations about art museum etiquette (i.e. TOUCH NOTHING) as we enter the galleries. Strapping into strollers is a totally appropriate part of this step. 6) Once inside, zero in on anything they might be interested in or recognize and play that up. Talk about the ones the kiddoes "like" while the adults take in the other pieces hoping for another kid-friendly one to come along -- i.e. something other than a portrait. View all multi-media presentations. Head off whining, "I'm bored" and signs of meltdown with reminders about what comes after the museum, including all escalators, elevators, automatic or revolving doors and stairs between you and the exit. Also, play up the obligatory museum fountains and be sure to bring along some pennies for making wishes. 7) 30 minutes later, leave. PS: Consider yourself very lucky if you manage a photo of the outing. 2 photos and you deserve a gold star for your superior parenting (i.e. luck). With these rules in mind we went to see, not 1, but 2!! (yes, we were overly ambitious), exhibits last week. The first was at the National Gallery of Art to see an exhibit of several Giuseppe Arcimboldo works, whom many have called the father of surrealism. No photos allowed, so click on his name to see what we saw. It was a fascinating collection, we all enjoyed the paintings on display, particularly the boys. Foolishly, we next headed to the Smithsonian Museum of American Art to see an exhibit showcasing Steven Spielberg and George Lucas' private collections of Norman Rockwell sketches, paintings, drawings etc. The exhibit was closing the next week and was packed. The boys reached their limit only moments after arriving and though we forged on, it was not a pleasant experience for anyone. And, the collection was enormous. I assumed private collection equaled modest size, not so much. I guess I should have realized that if one has enough money to buy a small country, then 40 or so Rockwell's (each) should be an easy lift. Fun piece on the way in/out of the exhibit. Can you decipher the message? We ended our day with a trip to McDonald's and a stroll through a Christmas market so by the time we piled back into the car, everyone was smiling. Next time, we'll be smarter, one museum, period. On the other hand, they both took 2.5 hour naps after we got home. So, maybe it wasn't so bad after all? No, it was. One museum, period. And I love the license plate thing! May I have a copy of your picture? I meant to get one before we left DC and I don't think I did. So cool! Even the license plates! 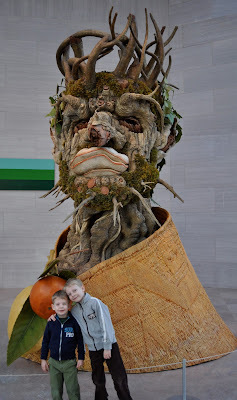 The one time we had gone to an art museum with our kids (3 & 5 at the time) it was in Seattle and I was so excited to go and then we got there and the kids were so restless and bored... I was searching high and low for a cow or anything they would have thought interesting! I love your writing. I loved the, "So, maybe it wasn't so bad after all? No, it was." I think I like #7 the best. That advice will serve me well, one day. The liscence plates spell out the Preamble of the United States Constitution. I love it. 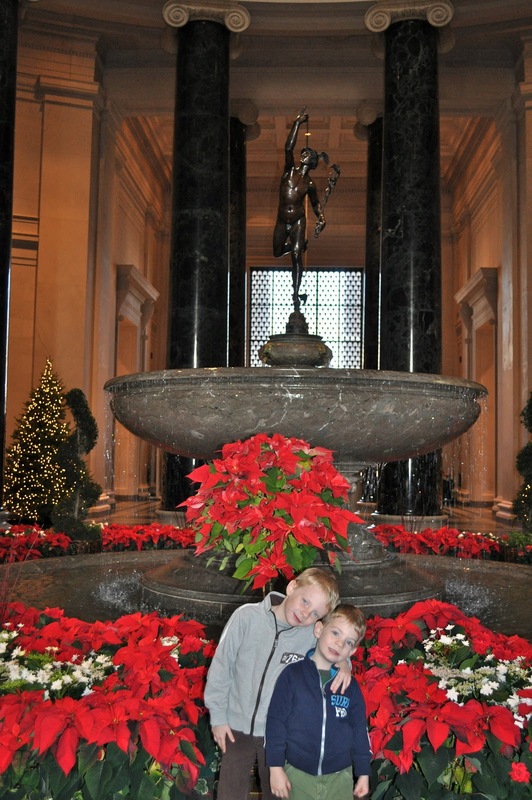 Our rambunctious little boys did a lot of rainy day running in the foyer by the waterfall in your picture above. (NOT good museum behavior but it sure beats the touching of the art they COULD have done). The gift shop in that particular museum is one of our favorites also. I, by the way, found your blog via the Round Up. Glad I did! Love your writing!